Take the first step to a wonderful adventure. Allow us to email you the latest news and updates about Esplanade Golf & Country Club of Naples. Discover an incomparable resort lifestyle where every day is a vacation and you never need to pack! Greet each morning ready to embrace all that Esplanade Golf and Country Club has to offer. Answer the invitation to live life to the fullest. Partake in the array of resort-style amenities. Follow meandering pathways that lead to vistas of sparkling lakes, perfectly manicured greens and fairways, nature preserves and wetlands. Experience a level of sophistication, luxury and relaxation like nowhere else. Begin this adventure of a lifetime with your choice of garden condos, coach or single-family homes designed for easy, yet elegant living. Come home to Esplanade today. Resort-style amenities are the hallmark of an Esplanade community. As a resident, you can choose from a stunning selection of active and leisure pursuits. Deciding how you will shape your day is entirely up to you. Beautifully appointed homes inspired by California Tuscan architecture are thoughtfully designed and built to Taylor Morrison’s highest standards of construction quality. 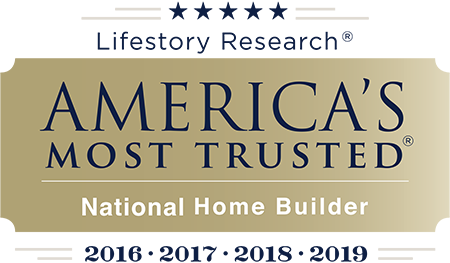 This is why we have been awarded America’s Most Trusted® Home Builder three years running. Choose from many spacious, open plans lavished with designer touches and sited to take advantage of lake, golf course or nature views. Personalize your home with flexible options and upgrades available from our Design Studio. Single-family homes with two to four bedrooms plus den, priced from the low $400s and offered in four collections ranging from 1,856 to 3,486 square feet. Coach homes with two to three bedrooms plus den, priced from the low $300s and offered in four plans ranging from 1,717 to 2,272 square feet. Condos with two bedrooms plus den, priced from the mid $200s, and offered in two floor plans ranging from 1,616 to 1,632 square feet. Why wait? Move-in-ready homes are available in all three Esplanade Golf and Country Club of Naples neighborhoods. Contact our Internet Home Consultants to learn more. Tucked away from busy roadways, Esplanade Golf and Country Club of Naples is conveniently close to the city's most desired shopping, fine dining, arts and entertainment venues, top-rated medical facilities and famed Gulf Coast beaches. Esplanade Golf & Country Club of Naples is an all-ages community. All information (including, but not limited to prices, views, availability, school assignments and ratings, incentives, floor plans, site plans, features, standards and options, assessments and fees, planned amenities, programs, conceptual artists' renderings, tax rates and community development plans) is not guaranteed and remains subject to change, or delay without notice. Prices may not include lot premiums, upgrades and options. Floor plans and elevations are an artist's conception and are not intended to show specific detailing. Floor plans are the property of Taylor Morrison, Inc. and its affiliates and are protected by U.S. copyright laws. Photos are for illustration only and do not necessarily represent actual community. Community improvements, recreational features and amenities described are based upon current development plans which are subject to change and under no obligation to be completed. Community Association and other fees many apply for certain activities and events. This is not an offering in any state where prohibited or otherwise restricted by law. Please see a Taylor Morrison Community Sales Manager for details and visit www.taylormorrison.com for additional disclaimers. © May, 2018, Taylor Morrison Esplanade Naples, LLC, CBC1256881. The Esplanade® name and logo are federally registered. All rights reserved.